Step out of your tub and into luxury with the 100-percent cotton 2-piece reversible rug set. Super soft, high pile plush and 100 percent cotton loops keep your feet comfortable and your bathroom floor dry. This set includes one oversized and one standard sized rug and is available in an array of solid color options. These rugs are so plush and lovely. I purchased 2 sets in my first order and was so impressed by the quality I ordered another set. I wasn't aware that the set had two rugs of different sizes, but that didn't bother me. They look gorgeous on my bathroom floors. Great set of cotton rugs. Nice weight. Purchased the grey and the color is rich looking and a perfect compliment to our master bathroom. Highly recommend. Merchandise arrived as advertised. Color shown matched color delivered. Really comfy to stand on. Would purchase same again. I love these rugs. They are reversible and washable and a great size for my bathroom. 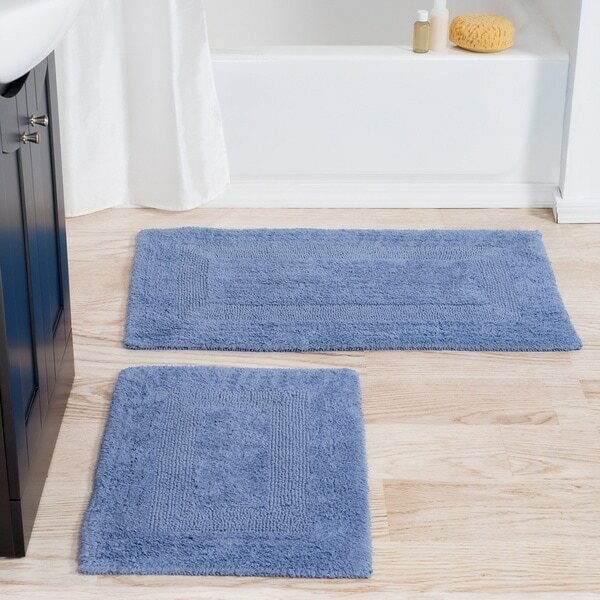 Plush cotton washable rugs look great on our bathroom floor. I love my rug set. The color is beautiful. But most importantly, the quality is good. This is my heaviest rug set. You won't regret buying this. Beautiful color and high quality. I purchased them to match a burnt orange color scheme and the brick color turned out to be a perfect match. They look great in a high end bathroom, but are still functional for everyday use. The rugs are of high quality and a beautiful bottle green color. Great purchase to brighten up an older bathroom. These two bath rugs obviously never hit quality control! Especially the smaller one. They're both missing areas of surface loops, the smaller one so badly that it's lopsided. Am keeping because color is what I need, is difficult to find &amp; returning is a pain. Would not recommend buying Windsor Home products if this is example of their stuff. I won't take that risk again. They met our particular requirements, color and size. Being reversible, we had to add a non skid under-mat as they were to be used in a small bathroom. I put this set in my guest bathroom and has gotten several compliments as we do have guest often, I would recommend this product to anyone who is thinking about it. Very nice that this item came with two rugs for the bath... and that they're reversible was also an added plus. Would recommend this item to a friend. Ok they do the job, but not very soft. I bought sets of these to go with the long one by the same maker. The short one makes a great door mat and the longer one in this set works well in front of the shower. They are very thick and reversible. I love them. This is definitely a nice set for the bathroom. It's nice to have one of the rugs a little bit bigger to go in front of the tub. The other is just perfect for in front of the sink. They feel really good on bare feet. Nice weight to these. Easy to wash. Very absorbent. I have a couple of sets. The color I need (Brick), matches my bathroom and the price is right! Needed bathroom rugs without rubber or latex to prevent discoloration of flooring. Also, wanted forest green which is very hard to find.